so i've decided i just cant sit around and wait and im going to build either a 100% solstrip or a cob with strips and bulbs (dont even know what kind of bulbs are used in cobs to give an idea of my knowledge) or how you put the units together .. im guessing you need aluminim cutting tools/drills which is fine - just need to figure it all out. probably wont be using it to grow anything but vegetables for the next ~year but i've decided to just do it anyway ..
current situation is living in montana with my wife and son while she does graduate school and rented out our house in alaska - living in an apartment complex with a kind of similar laundry area to the one i will be converting to grow area back home. making this thread to start a discussion on light building for a particular area so i can figure out what i need to buy as far as tools and equipment go - im also considering going into this as a connoisseur to potentially build light units for people in the area (WAY ahead of myself i know.. but i figured id mention it as far as tool investments go..if i find that i have a knack for it) - recently uprooted my career in information technology so im pretty bored and looking for something to apply myself to. here is a picture of the laundry area in my apartment - the dimensions are roughly 3 x 6' on the floor area in alaska is more like 4.5' x 8' - still havent decided if i want to use a tent of some-kind or run hvac directly through the sheetrock around the area. 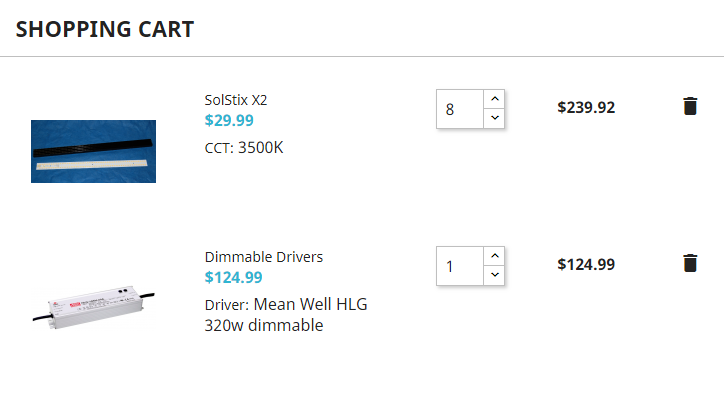 to start out.. im looking on solstrip.com and im guessing i need roughly - 6-8 strips/sinks/all the accessories and a dimmable driver? I dont see any pics? Samsung LM561C are the diodes used by solstrips. They are one of the most efficient LED diodes for horticultural use. I'm sure though I read somewhere that the LM561B (used by most of the quantum boards) diodes have more penetration where as the LM561C have better coverage and spread. solstips are stripped out boards with slightly different diodes? filling out my knowledge here.. never heard of a quantum board. Solstrips are lm561c diodes in a hard strip. With the PCB design being the brainchild of @Baudelaire COB stands for chip on board. If you are dipping a toe into diy lighting I plead with you to use strips. Mainly because the easiest method is parallel wiring on already soldered molex connections and they're only 24v across the board. If you are dipping a toe into diy lighting I plead with you to use strips. Mainly because the easiest method is parallel wiring on already soldered molex connections and they're only 24v across the board. Have a Google. Quantum boards are another very popular diy solution but you get nowhere near the coverage that solstrips give. do you think it would be better to build some sort of internal structure for the area and put a tent over it to match the length of the strips so they are 100% covering the plant canvas? what is the downside of going with higher voltage on the dimmable driver? TBH, you can run it straight in the room....if your not happy with your results at harvest, you can fine tune it and narrow the space to increase lumens per sq ft. The light strips will max out at 52 watts per strip, but they will run hot and burn out quickly.....recommended run at 48 watts continuess use. There are lots of ways to go about this, that's the flexibility of the system. The strips are pretty easy, due to the parallel. Running eight strips, I would suggest the HLG-320H-24 drivers. If you want this solely for flowering, I like the 2700K diodes. 3500K is a good all around spectrum. My vegging plants like the 5000K. Or you can mix spectrums. I have 3x 5000K strips on a HLG-120H-24B and 6x 2700K strips on a HLG-240H-24B. Since both of them are dimable I can vary the spectrum. This video is a good one for learning the basics of LED. any recommendations on where to buy aluminum rails for mounting the strips/sinks? I buy aluminum angle iron at lowes 1" x 1" x 1/8". Its pretty easy to cut with a hacksaw. jesus thanks for checking my work on that.. glad im starting this now..